What happened to the Maluti San, or Berg Bushmen of the Drakensberg? This is the question that hangs on the lips of every researcher interested in the history and prehistory of the Drakensberg. At a loss to provide an accurate account of their disappearance, it has long been widely assumed that they were either annihilated by encroaching black and while farmers, or were assimilated into the resident Zulu-, Xhosa- and Sotho-speaking groups who made their way into this area towards the middle of the 19th century. For mere than 8 000 years the Berg Bushmen inhabited the hidden glamour of the Drakensberg, which provided a natural fortress protecting these diminutive people against the invading strangers. The livid sandstone and basalt walls of the musty caverns and shelters provided a natural 55555 for the Bushmen's artistic expressions of their religious lives and remembered past. They created in the Berg one of the most celebrated natural outdoor galleries of more than 550 known sites of prehistoric art, the likes of which can compare with Lascaux in France and Alta Mira in Spain. Because of this unique national cultural heritage, the KwaZulu-Natal Drakensberg has been nominated as a potential World Heritage Site. But what happened to the architects of this remarkable display? Why do they no longer occupy their former hunting territory? We know that during the course of the 19th century the Berg Bushmen increasingly resorted to raiding cattle and horses of both white and black farmers, Farmers retaliated by organizing punitive expeditions to retrieve their stolen livestock and to eradicate the Bushmen. In 1879 the Bushmen made their last desperate stand when they aided their ally and protector, the Baphuti chief 'Mcorosi', in defending his mountain stronghold against British and colonial forces. It was a massacre, with the Baphuli chief losing his head for his daring. Those Bushmen who escaped were assimilated into the surrounding African groups. A few Bushmen were still glimpsed wandering about the cliffs and crags of the Berg for a few more years, lingering about their old, dead hearths, reluctant to leave their home, then they too simply vanished. However, in a change of mood, anthropologist Frans Prins happened upon some old German documentation clearly showing that some Bushmen left the foothills of the Central KwaZulu-Natal Drakensberg in 1879, the year of Moorosi's defeat. These are the memoirs of Father Filter who for many years was a transport rider between Natal and the then Eastern Transvaal. He described two groups of Bushmen - the 'black' Bushmen of Natal and the 'yellow' Bushmen of Lesotho. Both groups travelled together, after four years finally reaching the Lake Chrissie area in Eastern Transvaal. Father Filter became well-known to these Bushmen groups and he even transported them on his ox-wagon at times, so forming his own little 'Great Trek'. It appears that their choice of destination was based on long-sanding trade relations with Bushmen already resident in the area. 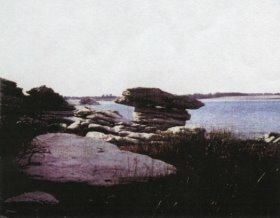 The landscape at Lake Chrissie contrasts with the berg with its monotonous khaki pan-pocked flats. But look under the dusty covers of this land and you will find an amazing array of natural and cultural riches. The parched, toothless maws of rocky overhangs gape towards the glassy surfaces of small lakes, providing natural habitations and safe havens for these incorrigible wanderers. Even the pans themselves provided shelter by concealing Bushmen from marauding Swazi impis and Boer commandos; tradition has it, by their remaining submerged for hours at a time breathing through reed pipes. Ethnologists have for some time known of a small Bushman community at Lake Chrissie, but it was never thought that they were the very last remnants of the great painters of the Drakensberg. Even in 1955 it was thought that the present generation was the last. However, almost half a century later Frans Prins found that there are almost 50 Bushman individuals still living in this area - most of whom are children. For almost five generations they have been farm labourers on sheep farms and have almost completely lost any link with their rich cultural heritage. Their original Xegwi language has been completely forgotten except for two very old men who can still remember fragments of this quaint 'click' speech. They remember stones about their forefathers painting on the rocks and hunting with bows and arrows but have no idea of how to do so themselves. And yet, in spite of this, they still regard themselves as Bushmen, or amaBushmana- this is their identity and all they have to cling to of their once illustrious past. Individuate well often refer to their short body stature and slant to the eyes when distinguishing themselves from their Swazi neighbours. Uniquely, the Drakensberg Bushwomen are the smallest of any racial group in the world - even shorter than the Congo Pygmies. Today, in spite of these distinguishing genetic traits, there is an acute sense of loss of their original cultural identity and way of life. A sense of nostalgia and sadness underlies their group unity. But what about their links to their original homeland in the Drakensberg and Maluti Mountains? There main cultural memories of this old haunt, the land of the Sotho, of open skies, broad vistas, prolific wildlife. Tradition has it that they had to leave their former abode in fear of being pursued by angry Boer commandos for stealing horses. Having lost much of their heritage, the Lake Chrissie Bushmen are eager to team more about what it was to be a Berg Bushman. They hope to reclaim a rich and diverse heritage and have even requested that Prins teach them more about the culture of their forefathers. 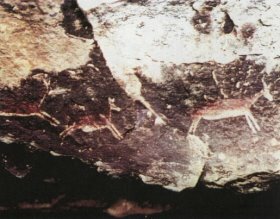 More than this, with the Drakensberg being considered as a World Heritage Site, the question arises whether the creators of this immense natural tapestry should be included in management and decision-making processes regarding the rock art. It would be fitting if they could also be trained and employed as guides to the art. It would also be a chance for international tourists to actually meet a legendary people who had once been forgotten, whose very 555 had almost been completely swept from history books as it was from the valleys and peaks of the Berg. It will be an ideal opportunity to reinstate the direct descendants of those talented painters in their original home, to bring full circle a dramatic, but little known, event in South Africa's history.